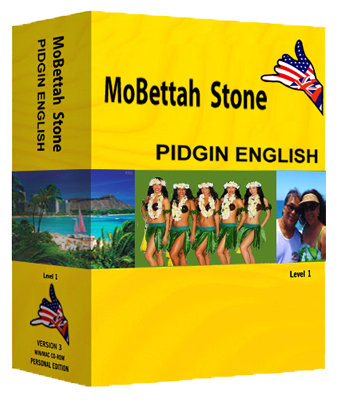 Locals say that Hawaiian Pidgin evolved from the plantation workers in their attempt to communicate with each other. Beginning with the Chinese migration as early as 1852 waves of other nationalities followed, Portuguese, Japanese, Filipinos, Koreans, Puerto Ricans, Norwegians, Germans, and Spaniards were known to have followed the labor migration. Plantation owners and supervisors in charge of running the plantations faced a new dilemma, the problem of communications. When newcomers, mostly Asian, first migrated to work on the sugar plantations in Hawaii many of them had limited English skills. English was not the migrant workers first language so English would have to be taught as they worked. Many workers learned to speak with broken English. Words were chopped up by their accents, and forming sentences with English words was broken up and incomplete and as a result Pidgin English was created. The Ilokanos were no exception in bringing their form of broken English. Being Ilokano myself and remembering my Ilokano relatives talking together I noticed that they used the word "de quan" alot when referring to something. I didn't even know what it meant but watching their body language and using their lipps to point at something I knew they were referring to some kind of thing or inanimate object. I heard my dad and uncles use that term many times in their conversations. I do believe the term "Da Kine" derives from the Ilokano term "De Quan" which is the Ilokano Sakada's contribution to Hawaiian Pidgin English. Eightyfive percent of the Filipino community in Hawaii are of Ilokano descent. I find it interesting how the Ilokano influence dominates the Filipino community in Hawaii. 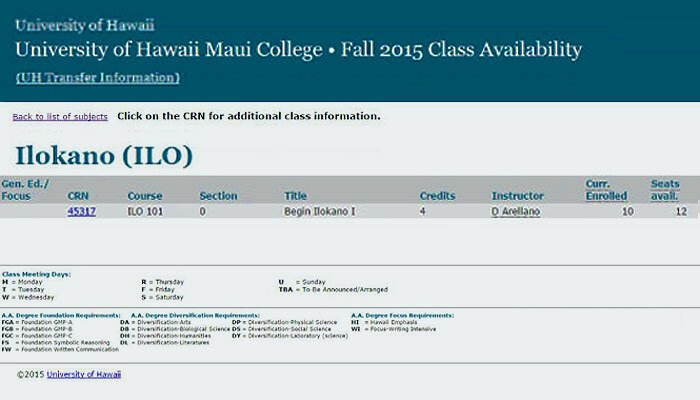 There are even classes at the University of Hawaii and some local community colleges on Ilokano language and culture. See the section of the college class schedule below. Notice how they spell Ilokano with a "K" instead of a "C". Reason for this is because in the ancient Philippine alphabet of "Baybayin" there is no "C" to make the short "k" sound. The letter "K" is used in place of that.